I have an iPhone 5 and love it. I plugged my iPhone into computer (Windows 8 if that matters) and copy and paste the photos onto my external hard drive. The only thing is, there are about 200 photos still on my phone that do not show up in any of the folders on my computer. Please someone help…I really need to get these pictures off my phone b/c they are of my new baby and I don’t want to lose them. The photos in iPhone Camera Roll are movable and can be copied to the folder in computer for a backup. Many iPhone users come up with the problem that the photos are not shown in computer, but they do available in their iPhone. So what to do when Camera Roll photos don’t show up on PC? The easiest way may be restarting iPhone. Users only need to turn off their iPhone and then turn on again to check out whether the photos can be moved. Or they can reset their iPhone (which won’t cause any data loss) by holding the Sleep/Wake button and the Home Button together until they see the Apple logo. The easy methods may bring your iPhone back to work and make the photos movable again. Start iTunes and go to “Edit > Preferences > Devices”, and check “Prevent iPods, iPhones and iPads from syncing automatically”. Plug iPhone into computer via USB cable, and iTunes will launch automatically. iTunes will recognize your iPhone and display the iPhone icon at the upper right corner. Click “File > Device > Back Up” at the upper left corner of iTunes to update your iPhone backup, which won’t make your iPhone data get lost. When the iPhone backup is updated, you can click the iPhone icon, and choose “Restore Backup” in the summary panel. 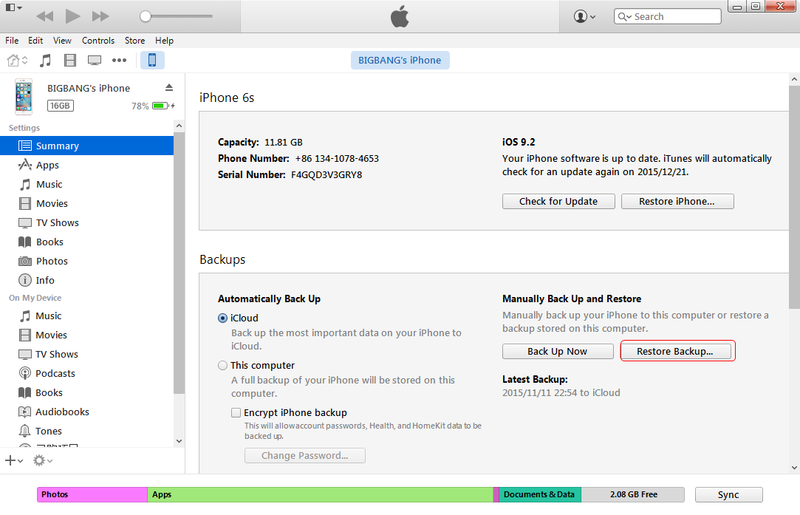 Choose the iPhone backup in the pop-up window, and click the “Restore” button. Note that you should pay attention to the updated time of the iPhone backup when you choose it in case that the backup isn’t updated. 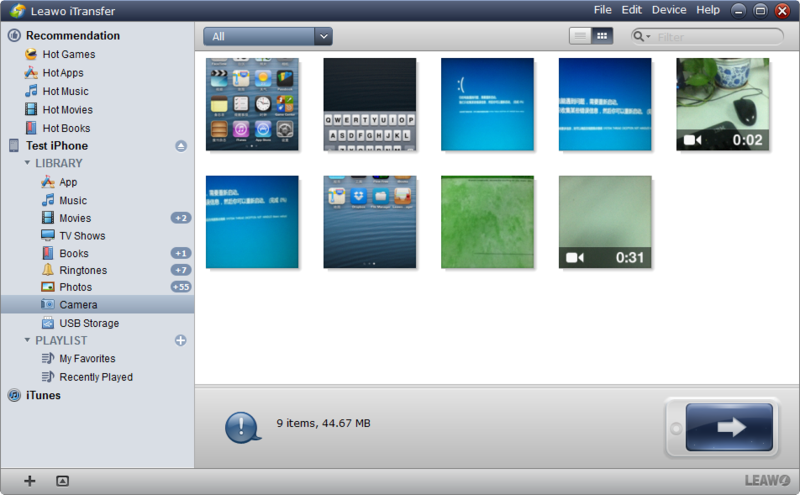 After clicking the restore button, iTunes will restore the contents in the backup to your iPhone. You will get the photos in the Camera Roll again, and you can check out whether the photos can be transferred to your computer now. If restoring iPhone isn’t workable, the iPhone transfer software may provide help. Speaking of the iPhone transfer software, iPhone users are able to find many pieces on the Internet. Among them, Leawo iTransfer can be regarded as one of the best. This software is used for transferring files among iOS devices, iTunes and PCs, and it helps users to get rid of the sync of iTunes. The following guidance will show you how to transfer Camera Roll to PC with Leawo iTransfer, and you are allowed to free download the software to have a try. Note that trial version has limited transfer times. Run Leawo iTransfer and connect iPhone to computer with the USB cable. The software will automatically detect the libraries of your iPhone. Choose “Camera Roll” at the left sidebar and then the photos and videos will be shown in the right part. 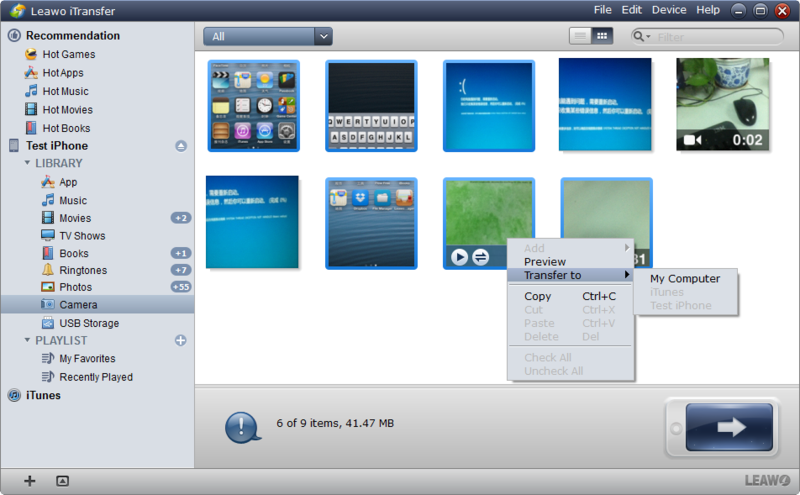 Click the transfer button at the right bottom to transfer all the photos and videos; or hold “Ctrl” key and click to select certain ones, and right-click the chosen photos to “Transfer to > My Computer”. After clicking the transfer button, you will see a pop-up dialog. Check “Save to Folder” and click “Open” to choose a folder on your computer to save the photos. Then click “Transfer Now” at the right bottom to start transferring photos from Camera Roll to computer. When the transfer is ongoing, please don’t disconnect your iPhone. 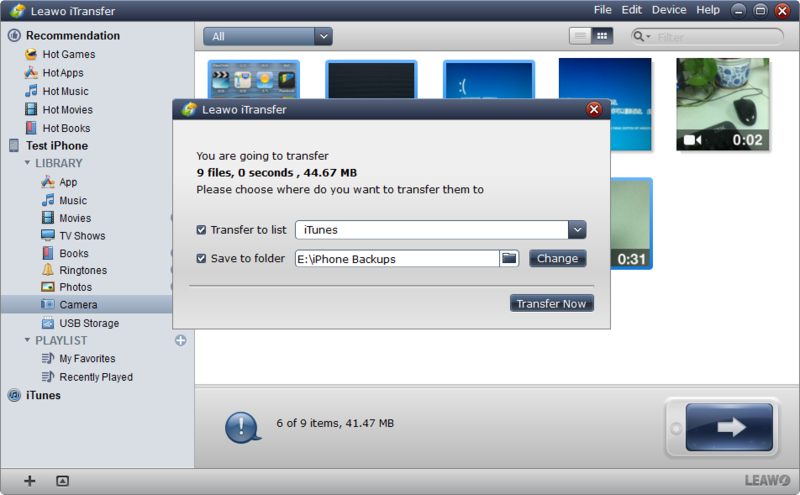 The progress bar in the pop-up dialog will show the percentage of the transfer process. After the transfer, you will get the photos in the target folder. If any photo couldn’t or didn’t be transferred, Leawo iTransfer will notice you which photos aren’t transferred. 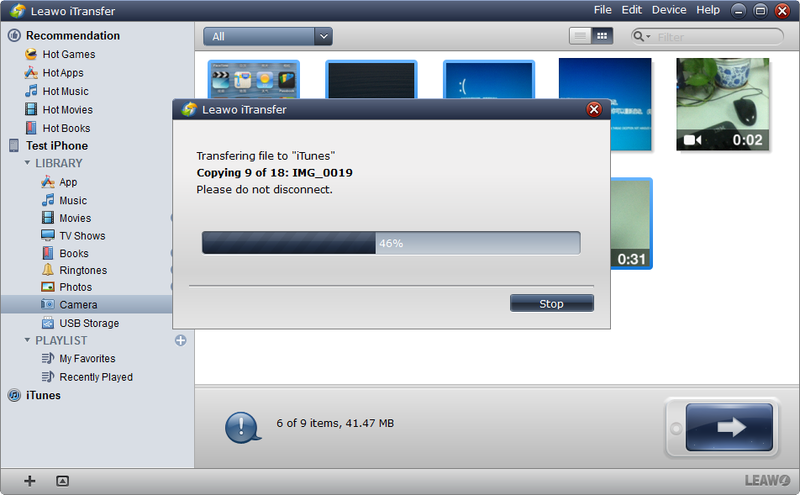 Leawo iTransfer is helpful for other kinds of data transfers among iOS devices, iTunes and PCs as well. If you are interested, don’t hesitate to check Leawo iTransfer out.